Diamond manufacturer's the largest propane powered refrigerators on the market. These units are American made by the Amish. Each unit is factory tested to ensure proper operation. 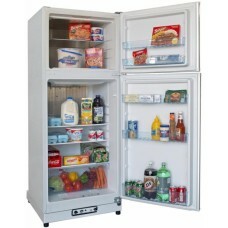 Each of the refrigerators listed below is stocked at our Distributor's warehouse in Ohio. Typically these units will leave the warehouse by common freight carrier within 48 hours. 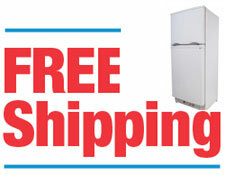 Diamond refrigerators are shipped directly from the supply warehouse in Kidron, OH. Average fuel consumption for Diamond is 1.5 lbs or .375 gallons per day. They are covered by a three year parts and labor warranty on the complete unit. Five year warranty on cooling unit. All warranties are "carry in service". Please see original warranty card supplied within the unit. All Diamond's are equipped with a Male 3/8" Flare Fitting located (if standing at front and facing the unit) at the rear right lower corner area. This type of fitting does not require tape, liquid, or paste sealers. Use a flex line to connect the unit to the gas supply. We recommend to connect to an On/Off valve. Use a flex line that is long enough to move the unit away from the wall to allow access to the rear for service. Be sure to leak test all connections prior to ignition and again immediately following ignition. Use a soapy water solution or a purpose "Gas Leak Detector" liquid and apply with a soft bristle brush. Inspect all connections for bubbles. All Diamond's are designed to operate from an LP Gas supply with 11" W.C. (Water Column) gas pressure. Your installer will be able to check the pressure at the time of installation or you can check it yourself with a Manometer. All absorption type cooling units operate with the use of gravity. The flow rate of the liquids is determined by the angle of the tubing on the cooling unit. It is vital that the unit be level as to get the correct flow rate for the best efficiency. 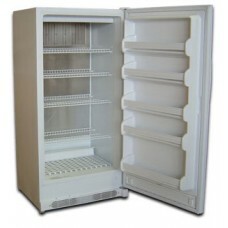 Use a level on the inside of the freezer box and level the unit left to right as well as front to back. If the floor is not stable or too out of level, using shims under the legs/rollers is an option. Air ventilation (circulation) is very important. 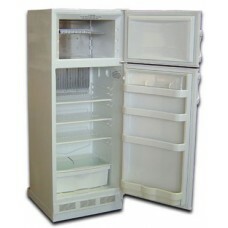 Note that a larger fridge produces more heat than a smaller size fridge therefore requiring more ventilation. Always provide plenty of air circulation behind and above the refrigerator. To prevent any heat "buildup" resulting from lack of ventilation. 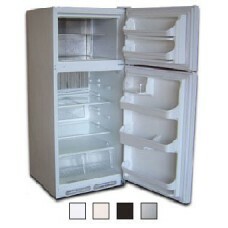 To provide ample airflow for proper refrigerator performance. To prevent any direct draft to the burner area which may result in the burner blowing out. When venting directly outside or into the attic, use a shield or baffle to prevent a direct draft from occurring. Allow at least 6" from the top of the refrigerator to ceiling or other obstructions. To create air circulation for better flow, see the following tips. A 2 1/2" X 12" hole cut in the floor at the rear of the unit with a register installed allowing intake air from the basement or crawl space will allow air to circulate up the back of the cooling unit. Use a register that can be opened and closed. Venting the Flue Pipe (exhaust) directly outside or into the attic with similar plumbing as a water heater requires will rid the area of most of the heat the refrigerator produces. Do not make a sealed connection between the Flue Pipe and Vent Pipe connection. Simply hover the Vent Pipe over the Flue Pipe thus allowing for some air to draft in at this point to create a good flow. 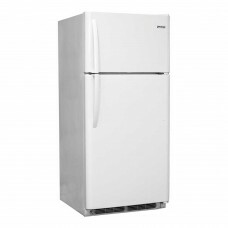 If the air circulation is suspect, roll refrigerator away from walls and/or surrounds and let run in this position for a period of time in order to compare performance to the intended location. 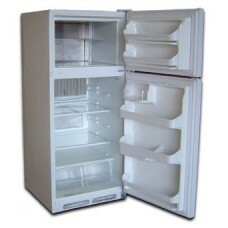 If the refrigerator compartment lowers drastically during this period while under similar circumstances of use, then the air circulation in the intended location is inadequate. FREE SHIPPING TO A COMMERCIAL ADDRESS OR FREIGHT TERMINAL IN THE CONTIGUOUS 48 STATES NO FREEZER T..
FREE SHIPPING TO A COMMERCIAL ADDRESS OR FREIGHT TERMINAL IN THE CONTIGUOUS 48 STATESManufactured by..
FREE SHIPPING TO A COMMERCIAL ADDRESS OR FREIGHT TERMINAL IN THE CONTIGUOUS 48 STATESThe Diamond Que..
FREE SHIPPING TO A COMMERCIAL ADDRESS OR FREIGHT TERMINAL IN THE CONTIGUOUS 48 STATESThe Diamond Sup..
FREE SHIPPING TO A COMMERCIAL ADDRESS OR FREIGHT TERMINAL IN THE CONTIGUOUS 48 STATESThe Diamond Hom..
FREE SHIPPING TO A COMMERCIAL ADDRESS OR FREIGHT TERMINAL IN THE CONTIGUOUS 48 STATESThe Diamond Eli..